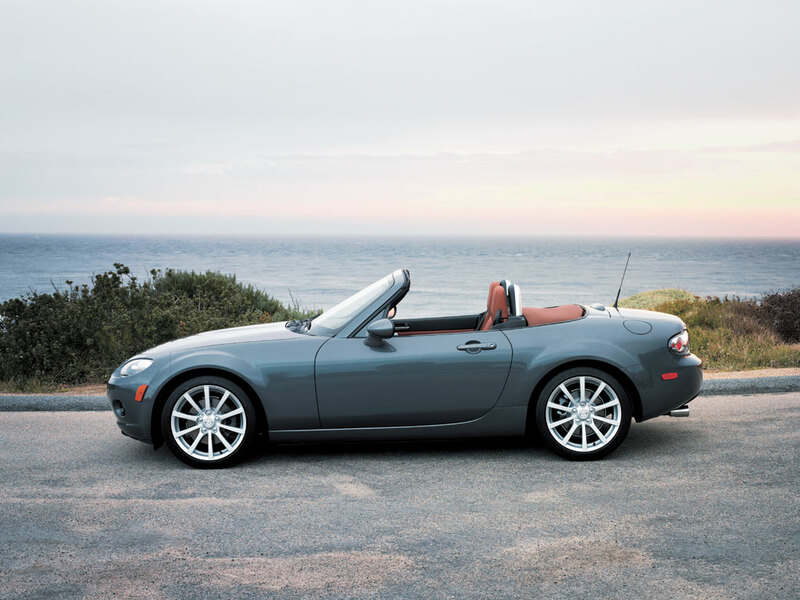 Production of the third-generation MX-5, code NC, began May 17, 2005, for delivery in August, for the 2006 model year. This was partially due to the declining sales of the MX-5 during its second generation run. At its introduction in 2005, it won theCar of the Year Japan Award. The exterior styling (done by Yasushi Nakamuta until 2003) resembles the original design, but unlike the update from NA to NB, which was mostly a nose/tail/interior change, the NC shares no components with the NB, except for the side-panel turning-lights on non-US models. The lead stylist of this model generation was Moray Callum. With the third generation, the suspension changed from a 4-wheel double wishbone setup to a front wishbone/rear multilink setup. Technologies like traction control and stability control were added to increase driveability. According to Car and Driver, the NC has a skidpad number of 0.90g. For the US, the engine is the new 16-valve, 2.0 L (120 cu in) MZR I4, producing 170 bhp (130 kW) and 140 lbf·ft (190 N·m) coupled to either a 5-speed or a 6-speed manual transmission or 158 bhp (118 kW) with the optional 6-speed automatic transmission. 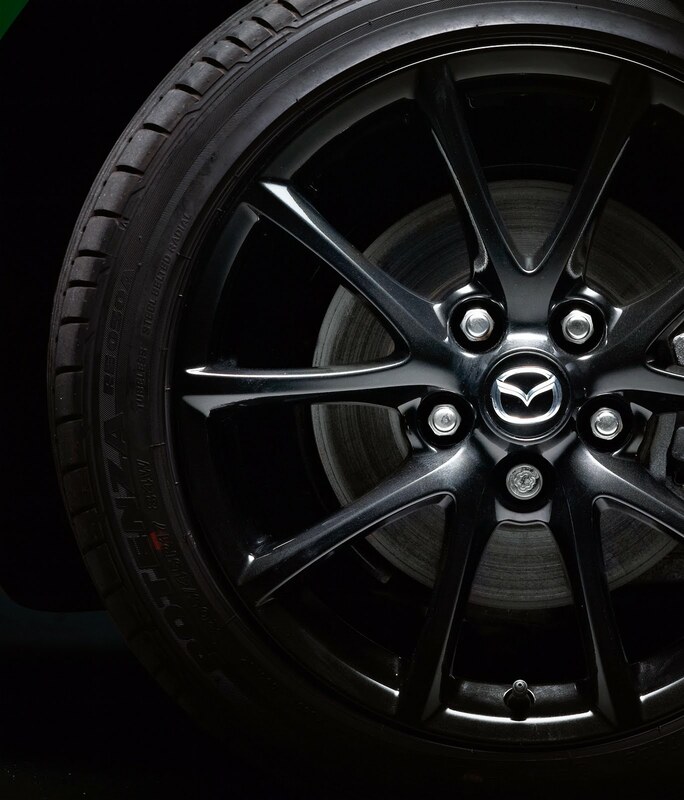 A limited slip differential is available with the 6-speed option. In Australia the 2.0 L (120 cu in) MZR is offered, rated at 118 kW (158 bhp) and 188 N·m (139 lbf·ft) and the 6-speed transmission and LSD are standard. In Europe, two engines are offered: the 2.0 L (120 cu in) MZR rated at 158 bhp (118 kW) and 188 N·m (139 lbf·ft), coupled to the 6-speed manual transmission; and a new 1.8 L (110 cu in) MZR, rated at 126 bhp (94 kW) and 167 N·m (123 lbf·ft), coupled to the 5-speed manual transmission. A six-speed automatic transmission, with steering wheel mounted paddle shifters, is optional. A test by Car and Driver magazine revealed a 0-60 mph (97 km/h) time of 6.5 s for the 2.0 L (120 cu in) U.S.-spec NC. Manufacturer figures for the European-spec model are: 0-100 km/h (62 mph) in 9.4 s (1.8 L (110 cu in)) and 7.9 s (2.0 L (120 cu in)). In Japan, this generation no longer complies with Japanese government regulationsconcerning vehicle exterior width dimensions, and buyers in Japan are now liable for additional costs for ownership. The NC was launched with a special edition called «3rd Generation Limited» which featured added chrome accents and special wheels. 3500 were built worldwide (300 in the UK, 750 in the US, 150 in Canada), delivered in advance of standard models. The MX-5 facelift was unveiled at the 2008 Paris Motor Show and Science Museum in London, and later in 2009 Chicago Auto Show. 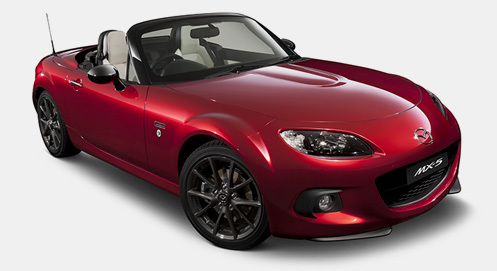 The 20th Anniversary Model is a limited (2000 units) version of MX-5 soft top with MZR 1.8L engine for European market, commemorating 20 years of MX-5. It includes a special exterior styling package with chrome grille, door handles and headlight fascia; silver-look fog lamp frames, specific 17-inch alloy wheels and 20th Anniversary logos, a strut tower bar. Available body colors include True Red, Crystal White Pearl and, specific for this edition, a new Aurora Blue (with matching painted decorative elements in the interior).The vehicle was unveiled in 2010 Geneva Motor Show. The 25th Anniversary Model is a limited (1099 units) version of the MX-5 with 2.0L engine, designed to celebrate 25 years of the MX-5. The base vehicle for this special edition was the top of the range Roadster Coupe 2.0 Sport Tech Nav model in the UK with 750 of the global 1099 model allocated to the UK market. All cars are painted in an exclusive colour, Soul Red Metallic and feature Brilliant Black A-Pillars, Roof Panels and Mirror Covers. Other additions include 17-inch Dark Gunmetal alloy wheels, a rear diffuser and chrome exhaust trim; each car also features a unique, Limited Edition numbered external badging. Interior changes include Light Stone heated leather seats featuring embossed 25th anniversary logos in the headrests with contrasting red stitching. This contrasting stitching continues on the steering wheel, gear stick boot and handbrake lever. Each car also has special 25th anniversary logo scuff plates on the door sills, a Dark Red hand painted decoration panel on the dash, Brilliant Black roll-over bar covers and drilled aluminium pedals. This model went on sale on August 1, 2014 in the UK; it sold out in the United States within 10 minutes.